If new version of theme is available, you would update your theme as soon as possible to have installed most recent version. Please remember to do your website/database backup just in case anything goes wrong. update theme and plugins with simple click in administration side using AIT Updater Plugin. It is the most simplest solution to do actualisation. If you made changes in parent theme files, you should keep backup of these files because your changes in files will be overwritten with default files from theme. Automatic updates are available through AIT Updater plugin. This plugin has to be uploaded and activated to check for updates and process whole update of products. 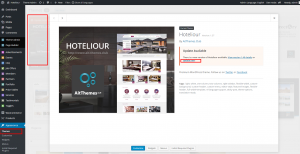 Because of that we have packed the latest themes versions with this plugin. 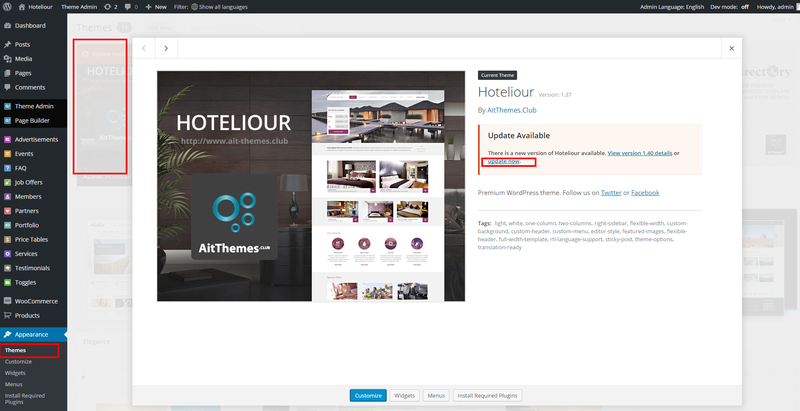 If you are using older theme version and you are not sure if your already active version supports AIT Updater plugin, follow please article in our Knowledge Base: Update old version of theme which doesn’t support AIT Updater plugin. Update via AIT Updater plugin require from you just few informations which have to be inserted in plugin options. Follow detailed documentation page of AIT Updater plugin which describe whole process from plugin installation to set up of all necessary options. With AIT Updater plugin installed and configured you will be always notified about new updates. When new version of theme or plugin is available, you are notified via standard WordPress bubble notifications in Dashboard > Updates menu. To update theme and plugins via FTP, you have to have login information from your hosting company to access website files via FTP. All what you have to do is basically just deletion of old theme or plugin, and upload folder with new version of theme or plugin in place of old version. Zip package with theme and plugins may be downloaded right from our website, sign in to your account, and download purchased theme from Download Themes section. Downloaded zip package with theme include also latest version of plugins which are provided directly with theme, although plugins may be downloaded directly from our website too, just navigate to Download Plugins section. Do not forget update also Plugins which were installed with theme and are included in theme package, inside folder ./ait-theme/plugins/. Process to update plugin via FTP is the same like update of theme described above.